Here we will begin to post some of the exciting developments in areas that we are working. We will focus on "snippits" of news items that may be of interest to our clients, and members of the cooperative. Yvette Dubel recently launched her "Eco Travel" magazine Context Magazine. 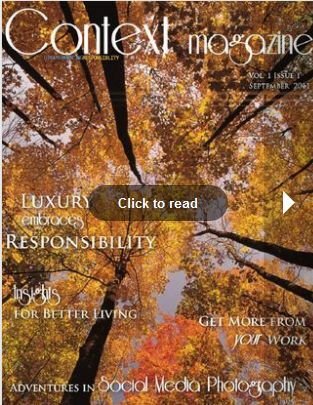 Context Magazine targets opportunities for Luxury travel while promoting responsible, sustainable solutions. Emmanuel Musinga met with the VE Team to go to the next stage with his vision for several countries in Africa. The VE is part of a bold, wonderful Vision to begin re-building the lives of people in refugee camps in Sudan, Uganda, Congolese, Somalia, Ethiopia and Eretria, and villages in the Congo, Rwanda and Zambia. Look for additional information here. Desmond Green recently officially launched the Moods Channel in Jamaica. 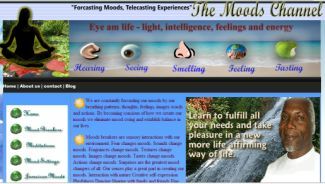 Affiliated with the Self Management Institute and Reverence for Life University, the Moods Channel invites us to connect with our internal guidance system and re-discover the peace, harmony and bliss that resides within our Beings, all via Conscious Deep Breathing. Other News Items - here we showcase various news items about pertinent events or developments directly associated with the VISION Excelerator initiatives, and efforts associated with particular regions and places. The location of one of the first regional pilot projects, some very interesting developments organizing various "pieces of the puzzle" for the RRES. Here we heard very encouraging information about various components of the food system being "taken back", so to speak. Augustana College's Dining Director, Garry Griffith has implemented a program using mostly local grown, organic foods. The school serves approximately 2000 students. The two keynote addresses were showcasing exciting "success stories" occurring in the region. Our team attended luncheon for the Advanced Technology Environmental and Energy Center The Center showcases various technologies, a interactive learning center and provides various curriculum for emerging energy technologies for educators.